As the planning application for the Medina Yard site draws near, the developer's architects are in talks with interested parties to establish a museum recalling the Island's outstanding shipbuilder. The development will remove all traces of the shipyard on the west bank, except for the crane. Without a museum, it will be difficult for visitors to imagine the sheer size of the operation and the range and quantity of ships it produced. J.S. White operated at Cowes for over 200 years, ultimately employing 3,500 people. Much of the housing that constitutes East and West Cowes today was created to serve the needs of a company which, at its peak, generated around 75% of the town's trade and commerce. Shipping was pivotal to the development of the British Empire and the nation's shipbuilders created the most powerful industry the world had ever seen. The museum will include documents, photographs and film covering the history of J.S. White. It might also cover the Medina's earlier shipbuilding past, dating from the 17th century. It is intended to demonstrate the range of engineering skills and technologies that were required to maintain a world lead in the industry. Some of the existing buildings still contain fittings that might be worth saving for inclusion in the museum. A great number of Cowes residents will have family connections with the company and may be prepared to loan their own memorabilia. The architects, John Thompson and Partners, have arranged a series of forums, inviting the Hammerhead Crane Trust and other interested parties to assist in the formulation of a building design, to be sited adjacent to 'Hammerhead Square'. It is thought the planning application will be presented early in the year. Top. A view of the West Cowes side of the shipyard in its heyday. Left. 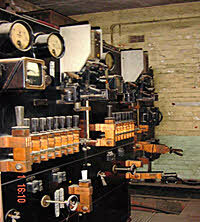 The site was powered through a central DC transformer and the Grade II* listed switchgear will feature in the museum. Above. Many of the gantry cranes are still in place. This early manually operated example, made by Henry J Coles, is thought to be worth saving. The council's plans for the 2015/6 budget include some savings within the service, involving the loss of one facility and a change of location for another. The major change will be withdrawal of funding for the Heritage Education Service, located at Carisbrooke Castle. Introducing the story of our past to schoolchildren has been a commitment within the council's heritage facilities for decades. They liaised with schools to provide a programme of events linked to key stages. The programme covered a range of experiences, including museum tours, interactive activities and practical projects. This cut would seem to be the only measure involving a labour reduction within the service, at least in this budget round. It remains to be seen whether any local history organisations or charities can step in to provide events for schools that can partly offset the loss. The council had already warned that the level of savings required would result in many non-essential services having funding withdrawn, so the closure of the education section was probably inevitable. Museums also fall into this category but they appear to have survived, probably because they are a classed as tourist attractions, which is an area the council may still wish to protect. A survey inviting the public to give their preferences for cuts resulted in 78% voting for withdrawal of funding for archaeology. However, this was in light of the survey incorrectly classifying the service as non-statutory. There may be other ways to provide an archaeological input but it is likely to remain a budgeted cost. It's not clear how this error arose, although it might indicate an understandable climate of desperation surrounding the budget. The council plan to make a capital gain by moving the archaeology operation from Clatterford to their premises at Westridge. This will release the Clatterford property for sale. The council's embryo archaeology service moved from Carisbrooke Castle to Clatterford in 1981. Past cuts have already reduced the department to little more than essential work and there seems little prospect of it ever returning to the range of projects they once enjoyed. In years hence, the Clatterford facility may well be looked back on as home to the golden age of Island archaeology. The published council cuts refer to the 2015/6 budget. There are more to follow in the coming years, so we probably haven't seen the last of savings within the Heritage Service. Twenty years ago the Steephill Cove site began to produce a vast amount of complex and intriguing archaeology, with excavations spanning many years. The current outline planning application for onshore elements of the Perpetuus Tidal Energy project will call for excavations close to the original site. Until the discoveries in the 1990s, the coastal area around Steephill Cove had been thought of as never being anything more than sparsely populated. By the end of the decade, the archaeology had created a different picture. There were two main sets of excavations. The major archaeology project evolved around the startling discovery of a cemetery containing 41 burials, the exposing of which involved long and complex excavations. The burials were thought to date from the early medieval period. In addition, eleven re-deposited inhumations were uncovered and a medieval dry-stone wall associated with eleventh to twelfth century pottery. Another set of excavations at Flowers Brook Recreation Ground found stratified deposits of a late Saxon and early medieval settlement. These were discovered on the more gently sloping northern part of the site. They included well preserved structural remains. Burials of uncertain date were also recovered, both in situ in graves and in unstratified deposits. The general picture is of a sizeable community dating from late Saxon through early medieval. It is thought many of the structures associated with the community, including the church, could have been lost to coastal erosion. There is still some question over dates for the site but it would appear the community had probably ceased to exist by the end of the 13th century. If the Perpetuus Tidal Energy planning application is successful, it will call for underground cabling of 500 metres in a trench 3-10 metres wide. The exact position of the cabling has yet to be established but it is almost certain to cross an area that holds the possibility of uncovering skeletal remains. The sensitive nature of such finds will probably call for an archaeological excavation of the route before any work can begin. Previous archaeology in process at Steephill Cove.